MISSOURI: Republican Josh Hawley Flips Senate Seat - Joe.My.God. Missouri Attorney General Josh Hawley won the closely watched Senate race in Missouri on Tuesday night, handing Republicans a significant victory as they look to expand their majority. 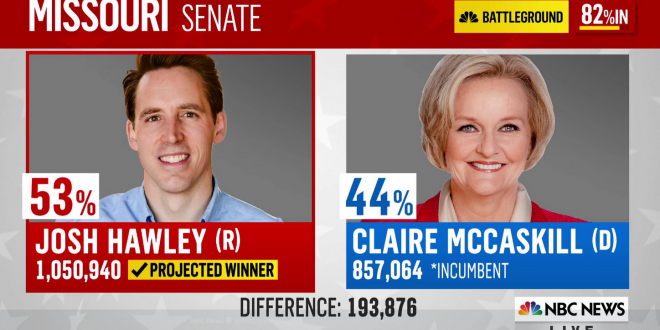 Hawley defeated Democratic Sen. Claire McCaskill (D-Mo. ), who was viewed as one of the most vulnerable incumbents up for reelection after President Trump won her state in 2016 by roughly 18 points. The successful flip of the Missouri seat from Democratic control is a boon for Republicans, who viewed the state, as well as Indiana and North Dakota, as their best shots of picking off Democratic incumbents and building on their narrow 51-49 Senate majority.